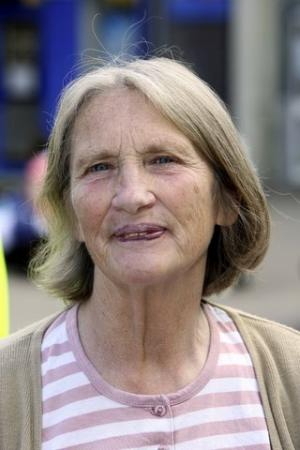 Sixty-seven year old Sylvia Boyes, a Quaker from Keighley, appeared today at Bingley Magistrates Court. 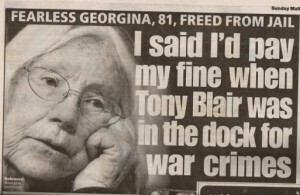 She was sentenced to 14 days in New Hall Prison for refusing to pay fines arising from a series of protests against Trident in and around Faslane Naval Base in Scotland during the summer of 2009. Boyes is the third peace activist sentenced to prison in the United Kingdom in two weeks. 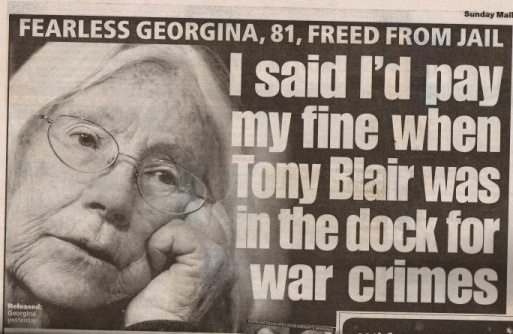 Eighty-one year old Georgina Smith was jailed a week ago for 45 days for refusal to pay a £3000 compensation order for her part in painting the Scottish High Court, also in protest against Trident. Chris Cole was sentenced January 19 to 30 days for nonpayment of fines from a graffiti protest at a 2009 London arms trade fair. Cole was just released February 2. With statutory credit, Boyes should be released after about one week.